The JTE RF Shuttle is a unique RF welding solution for companies needing the efficiencies of a traveling head welder, without the cost. 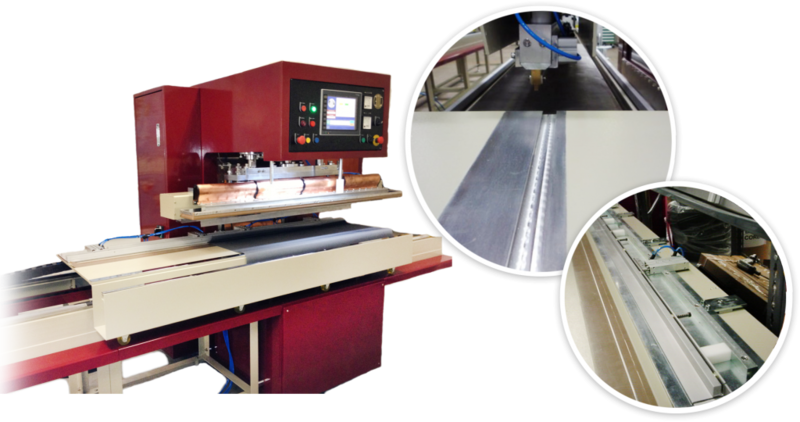 With the industry’s only sliding integrated table/trough for material storage, and an extra wide platen for shaped welds, this bar welder will do the work of multiple machines at half the price of a traveling RF welder. The sliding table comes standard in 14 ft. lengths but can be expanded to your specifications. Precision guides for pockets, hems, zippers, splines, or keder, may be mounted onto the table for the most accurate welds with minimum setup. The front or rear mounted ground foot is one of the many ways that JTE sets new standards for minimal RF emissions. Magnets help to hold the material while it is advanced into the welder, and the standard tool length is 60 inches.